Enter your details below to receive a call from a sales agent. For support-related queries, click here. For a small business to get a credit card terminal in South Africa involved a process of several weeks of applying for a device and having it delivered. Own your card machine with one payment and no recurring costs. Signup is simple with no long-term commitments or contracts. Perfect for all businesses. Big or small. and link your bank account. Connect your Android or iOS device wirelessly and accept card payments. 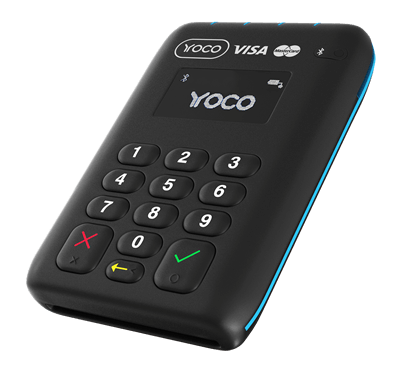 Yoco card machines work for any type or size business. Once paid for, the card machine is yours - there are no lock-in contracts or hidden costs, just a small fee per transaction. The Wireless Pro is the latest in mobile card reader technology. Its ergonomic design and long battery life make it the perfect card payment solution for busy environments. Great for fast-moving restaurants, cafes, retail stores and delivery services. The Wireless Lite is a compact and durable card reader for taking payments in-store or on the go. It's the world's best selling mobile card reader. Perfect for markets, beauty salons, professional services and tradesmen. Your rate goes down as your sales go up. It’s simple. Sell more, pay less. Your rates are automatically adjusted as your business grows. 30 Day risk-free money-back guarantee. Get the Yoco POS app for free with your Yoco card machine. Run the app on your existing Android or iOS smart device. Add products, track sales and send digital receipts. 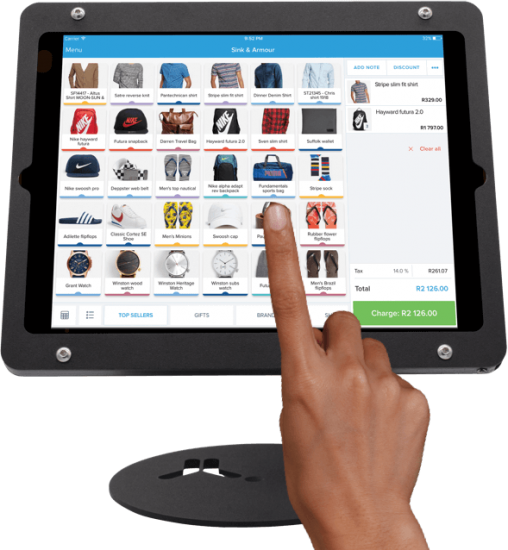 The free Yoco Point of Sale software lets you sell simply, manage easily and spend less time on admin, giving you the freedom to focus on building your business. With this kit, cash-based businesses can start accepting cards and tracking metrics such as top selling products, peak sales periods, and inventory flows. Start growing your business today with Yoco. Copyright © 2019 Yoco Technologies (Pty) Ltd.